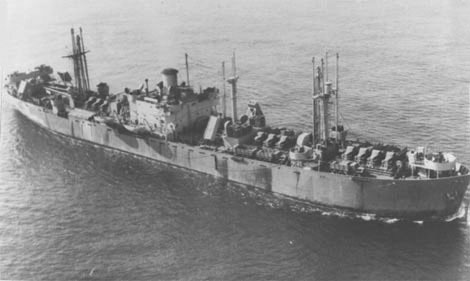 Photo taken 1943 before modification for carrying Mules.. The page includes a calendar of event for the Peter Silvester and a report of the search undertaken for the rescue of the crew and passengers. My thanks to Davis Stevens an Australian Naval Historian for the book U boat Far From Home. He furnishes facts and information about the U862 (the German U-boat) and the sinking from it's point of view. My thanks to the National Archives of the USA and Australia, The help of Tom Bowerman of the Armed-Guard page, The contributions of other survivors, and the patience of my wife for the time it took for me to collect the information.